On October 26, Nathan Lane will open on Broadway in Simon Gray's Butley. This revival of the Tony-award winning drama opened at the Huntington Theatre Company in Boston in the fall of 2003; earlier this month it began previews at the Booth Theatre where it will run until January. Opting to leave behind, for the most part, the larger than life persona he inhabits for most of his roles (Max Biallystock, Pseudolus, The Birdcage) Lane plays the title role with acerbic charm. Butley is a play length character sketch of Ben Butley, a TS Elliot scholar at the fictitious London University in the 1970s. Burnt out, unable to grade papers or hold tutorials, Butley returns to school on the worst day of his life. Over the course of a single day, he learns that his estranged wife Anne is divorcing him to marry "the most boring man in London," his literary protege and lover Joey is leaving him for another man (and his own office), and his less talented colleague Edna has found a publisher for her magnum opus on Byron, which has taken her twenty years to write. Colleagues and students alike cower before this tyrranical, despotic narcissist. Imbibing scotch and spewing forth pure vitriol, Butley reduces his weaker interlocutors to tears regularly, while his manic bon mots, composed from nursery rhymes, are shouted at retreating backs and empty rooms alike. Only Joey's new lover, Reg, stands his ground. 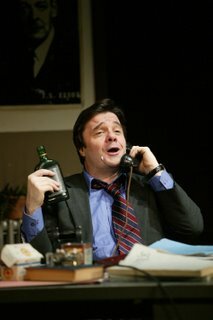 Performed with apolmb by Darren Pettie in his Broadway debut, Reg's steely exterior is unruffled by Butley's antics. Reg sees him for what he, a pathetic, drunken failure, not worth his time. The first act of Butley is pedantic. The confrontation between Butley and his wife Anne is unimaginative and lacks energy, namely because he seems unphased by his wife's departure. He is more appalled by whom Anne chooses to marry than the fact that she is marrying. Only in the second act does Gray's writing really hit its stride. As the play becomes darker and more tragic, it also becomes eminently more interesting. As Butley's life finally crashes down around him, the audience begins to wonder, what might have been if he had cared about something—his wife, his lover, his teaching, or his students—more than himself. Nathan Lane's celebrity cache will fill the seats at the Booth, and hopefully audiences will stay for the second half to see the real fireworks. Lane can act, and Butley offers the perfect venue to display his talent.